Tomorrow Corporation Games Have Arrived, Now on Nintendo Switch! 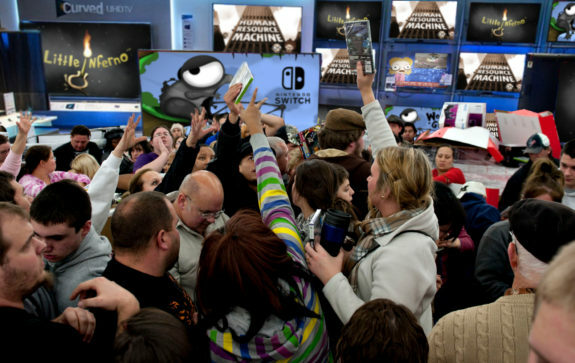 Actual photo of the Nintendo Switch eShop. Customers enlarged to show texture. Move over, Zelda, we’re here! 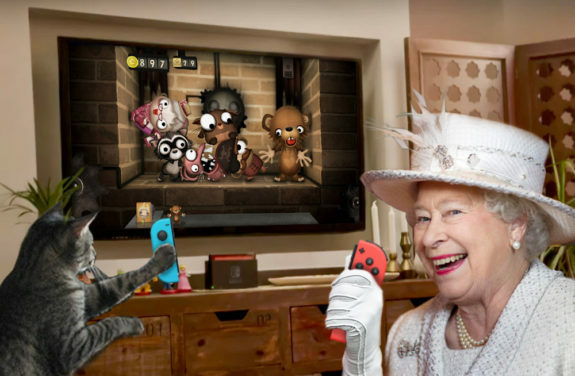 World of Goo, Little Inferno, and Human Resource Machine are now available on Switch devices! Q: What special features do these Switch editions have? They are on the Switch! All games come with their original soundtracks. Turn up the volume on your Switch and delight everyone on your subway car or flight! World of Goo and Little Inferno have cooperative local multiplayer! Playing with a friend is now our favorite way to play. All 3 games playable in Handheld Mode using the touch screen, or in Tabletop Mode or TV Mode using using one or both Joy-Con controllers. Small tweaks and improvements throughout, visible only to the most observant observers. Q: Where can I get them?! A: On the eShop on your Switch! Q: Can I get them all as a bundle? Q: Can I have them all in a physical box? A: We are looking into a physical version, but it’s a lot trickier than the digital world we’re all living in now. If we do find a way to make a physical version, it will not be for a while. In the meantime, you are welcome to download the games to your Switch, and then put your Switch in a box. Is a physical version something you want? Let us know! Q: What is the price of these multiple award winning games? A: Each game is listed at 9.99 USD, and the experience will stay with you for a lifetime! Q: Hello! I am from Europe and/or Australia. When can I experience these award winning games? A: Hola! Guttentag! Où est la bibliothèque? We have heard all three games will release in Europe and Australia on Thursday, 3/23. Profitez-en! Genieten! наслаждайтесь! Q: Help! When are your games coming out? Enthusiastic players enjoy multiplayer Little Inferno. For those of you lucky enough to have a friend, invite them to your rooftop party! Switch editions of World of Goo and Little Inferno will both have cooperative local multiplayer – the best kind of multiplayer. Q: I do not have any friends? A: We’ve all been there. In the meantime, you can always play single player, or with two hands. Q: Multiplayer Little Inferno, a Switch exclusive?! A: Yes! The brand new Switch Edition is the first and only version of Little Inferno to feature multiplayer. Now you can drag a friend through your personal existential crisis! It’s incredibly satisfying to rip things apart and burn it all down with a friend. Also perfect for couples. Q: But I want to play by myself! A: You’re in luck! We got single player Little Inferno approved first, and multiplayer approved a little bit later. So the single player version will launch first, and then the multiplayer update will roll out automatically about a week later. It should all happen magically and you won’t have to do anything special, except sit back and enjoy that brief moment of alone time while you’ve got it. Q: A free update?! Will there be pink logs? A: Due to inexplicable, overwhelming, demand for pink logs, Tomorrow Corporation is considering branching out into the pink log manufacturing business. Management does not know why pink logs are so popular, but is happy to accommodate. Q: I thought I remember playing World of Goo with a friend … a long time ago? A: Many years and several generations ago, the original Wii version supported playing with more than one Wii controller. We think this is the first version since then to feature multiplayer. Q: Is Human Resource Machine multiplayer? A: We thought about it, and debated it, and decided it would be too chaotic for a game that needs such concentration. But if players want it and can make a thoughtful case for it, we’ll consider adding it! Q: I am not a cooperative person and do not want to cooperate with others. A: You can always play single player! Good luck out there, and see you … Tomorrow! We Have a Switch Release Date…! Princess Peach has smiled upon us, and granted us a release date for – THIS WEEK! World of Goo, Little Inferno, and Human Resource Machine Switch editions will all be available in North America this Thursday, March 16! We haven’t received an official confirmation from Nintendo of Europe, but we hope to have good news for our European friends soon. And our intern made us Switch eShop trailers for all three games, delicately embedded below. 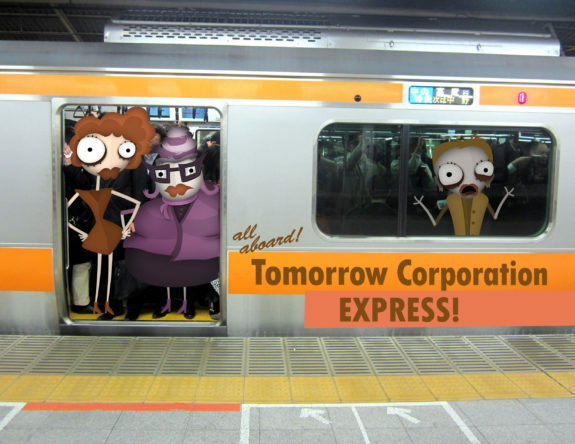 It was a long, dangerous journey, but here comes the Tomorrow Corporation train! Stand back. The doors are closing. Next stop: Nintendo eShop!